The quest for the perfect cup of coffee continues at the JOY FM. And once again, Rob Langer is leading the charge. It was Rob who introduced us to coffee with butter from grass fed cows. This time Rob adds a little (ok, maybe more than a little, a lot actually) coconut oil. Rob brewed up a blender full (too full, as you’ll see in the accompanying video) of coffee on the Keurig, added the butter and coconut oil and hit “blend.” The result, after cleaning up the mess from the overfull blender, was delightful. What’s next in the search for exotic coffee mixtures? 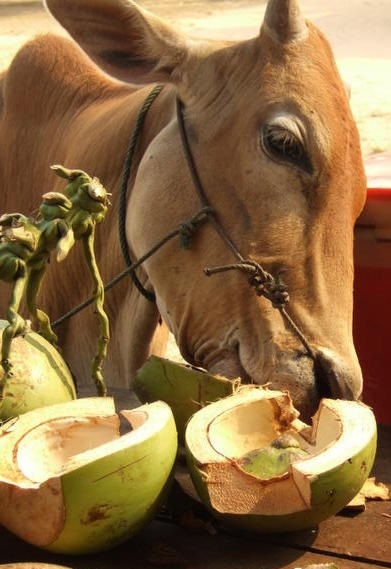 I’m thinking butter from coconut fed cows!